When you are contemplating how to start a compost pile there are different factors to consider. We’re going to cover starting a compost pile, including location, considerations for compost bins, the composting method that is best to use, and how to make compost by assembling and adding materials to make a compost pile. The benefits of compost include not only a slow release nutrient source for your garden, but an array of other benefits such as increased water holding capacity in soil and the decomposition of toxins such as herbicides and pesticides, to name a few. High quality compost can also be used in making compost tea. Compost tea is simply the extraction of the beneficial microbes from the surface of the compost and applying the compost microbes in liquid form onto plants and soil. It’s probiotic for plants! First before you start a compost pile you need to determine what the best method of making compost is, based the quality of compost you desire and how much effort you want to put into making high quality compost. Not all composting methods create that same quality of compost. The best compost is that which is done using the hot composting method. Composting, from a professional standpoint (the type you purchase in a gardening store), is the process of decomposing organic matter in the presence of oxygen and moisture. Hot composting method is simply the best way to start a compost pile, but it requires some work. If you don’t think you’re going to want to work to make high quality compost and can be satisfied with making compost that may be full of weeds and even a few diseases, then the static compost is a far less labor intensive way to start composting. A static compost pile still involves work in assembling the materials but you don’t turn it. I don’t recommend it since it ends up making weedy compost, and we spend enough time in our garden pulling up unwanted plants. When you are start a compost pile there are two main ways of making a compost pile – a compost heap and a compost bin. If you want things neat and tidy and better able to control keeping critters out, then a compost bin is the way to go when you start composting. It’s the preferred method for most. 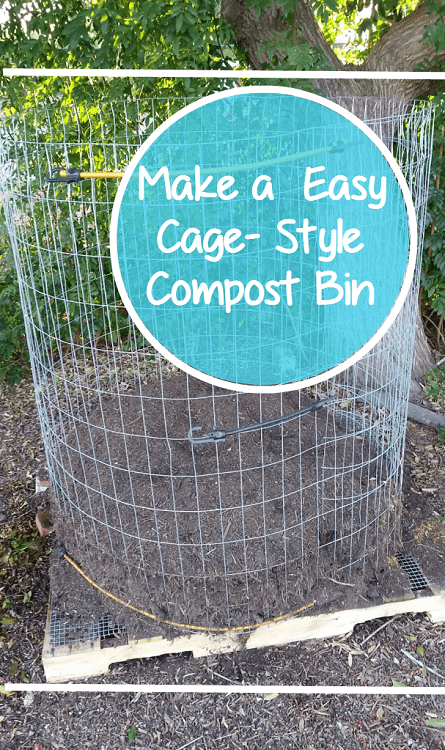 A DIY Compost Bin is an easy, quick and inexpensive way to start. There are compost bins for purchase on the market, but they should be at least 3 feet x 3 feet in size and have good air circulation in order to be effective in making a compost pile. A compost heap is simply a pile of materials placed directly on the ground (in an area with good drainage). Compost heaps are good at letting all the compost critters move in quickly and easily, but it’s hard to keep the unwanted critters such as rodents, raccoons and even dogs away from your compost heap. What about the compost tumblers? Yes they are neat and are good at keeping unwanted critters out of the compost pile, but frankly they are terrible at making compost. I had one for a couple of years and kept getting an undecomposted glob of materials as the end result. It was either too wet or too dry and it had no way of letting all the beneficial microbes and other composting helpers into the pile. It also stank, which is the sure sign of it going anaerobic – the perfect environment for harboring plant diseases. Talking about counter-productive. I ended up throwing the compost tumbler away. Hindsight, I should have converted it into a worm bin, but I didn’t. Yes, some municipalities require a closed container compost receptacle if you are in an urban area, but you are better off doing a DIY Compost Bin or purchasing one that stands on its own and has plenty of air spaces on the sides, and open in the bottom. Before you make a compost pile you need to consider the location of the compost pile. Too far away, then you are not motivated to give the compost pile the attention it may need. If the compost pile is assembled on uneven ground in a compost bin, then the compost pile may tip over. No fun. So when starting a compost pile, the initial location merits some thought. When you are researching how to start composting you will hear about “green” materials and “brown materials” for the compost pile. Let’s break it down further to make your compost pile even more successful. 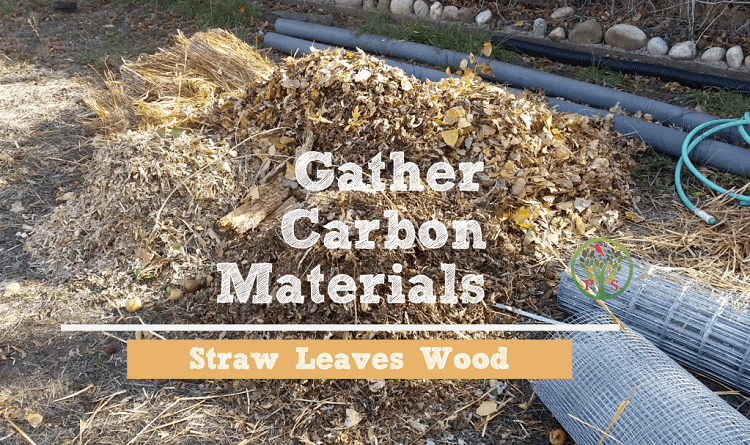 Green materials in the compost pile are what makes the compost pile heat up quickly and stay heated up in order for the material to be decomposed into material for your garden. Green is also called “Nitrogen” and “High Nitrogen” material, and are materials that are harvested green or have a narrow carbon to nitrogen ratio. High Nitrogen materials include manures, grains and nitrogen fixing plants such as alfalfa. They are what “gets the party started” and will start your compost pile getting hot within a day or two. 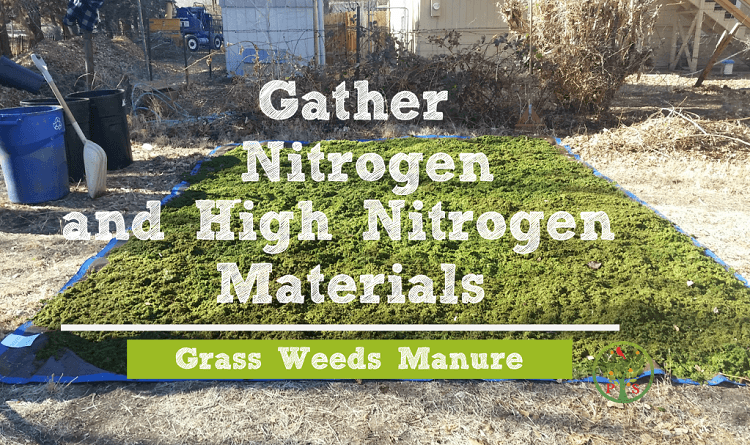 Slightly less narrow carbon to nitrogen ratio green materials (materials that are harvested while still alive) include grass clipping, food scraps, hedge clippings, fruit and hay. They are what keeps the pile hot and will assist in breaking down the organic material quickly. It’s the green material that causes the pile go get hot, and as a result it must be turned to keep air circulating in the inside of the pile. Otherwise the microbes will use up all the oxygen and your compost pile will go anaerobic. Anaerobic conditions foster the growth of disease and pathogens we don’t want ourselves or our plants exposed to. Anaerobic compost is not good for our garden – period! Brown materials, also known as “Carbon” are materials that are cut dead and have a wide Carbon to Nitrogen ratio. This includes wood chips, fallen leaves and straw. Making a compost pile with leaves is a great way decompose all those fallen leaves quickly. You can also stockpile the leaves in the fall in a compost bin and use it when you are ready to make the compost pile. Assemble Green and Brown Materials per the volume of your compost bin. 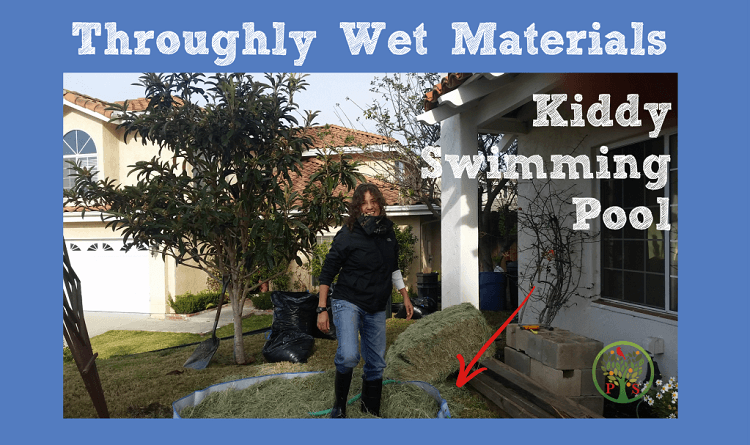 Next when starting a compost pile all the materials need to be thoroughly wet. Soak any wood chips the night before. The organisms responsible for making compost need moisture to do their job. However to saturate it since too wet can lead to anaerobic conditions. Target about 40-50% moisture. That’s about 1-2 drops of moisture coming out of the materials when squeezed between the fingers. 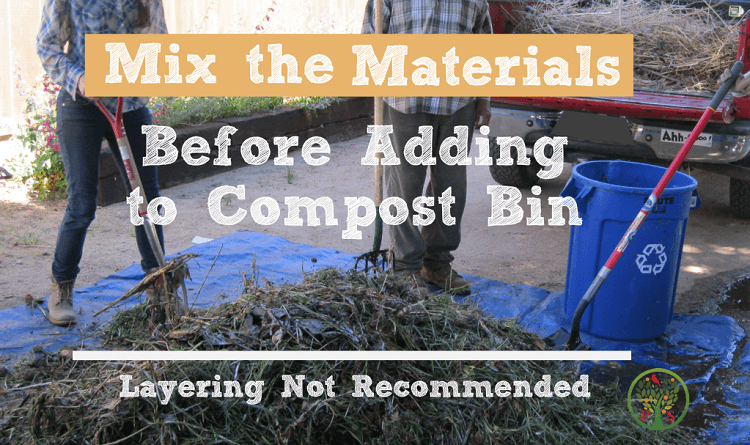 This may seem a bit contrary to what the mainstream “lasagna” method of a static compost pile tell you to do, but mix all the materials together FIRST before adding it to the compost bin. In order to start a compost pile correctly, you want to mix the browns and green together so that all the materials get broken down into compost. When you layer the materials there will be pockets where decomposition doesn’t take place. I find it best to mix all the materials first on a tarp, and even better when you have a group of friends to help you out. After all the materials have been added to the compost bin, the compost pile should be covered. This keeps moisture in, particularly if you live in a hot dry climate. It also keeps the rain out which may saturate your compost pile, making it go anaerobic. 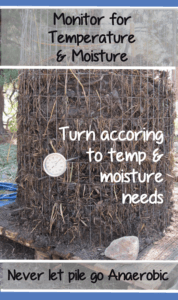 Next, to start a compost pile, you will need to monitor it for temperature and moisture. The pile will need to be turned at least 3 times in order for the outside material to receive the heat treatment necessary for all weed seeds and potential disease to be killed.